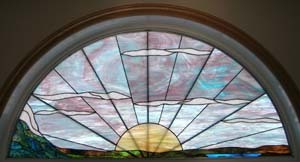 We have always been interested in stained glass, with its color and beauty. 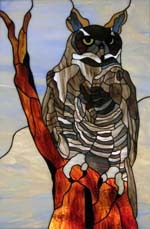 We have a lifelong friend who offered us some stained glass courses in Arizona. She was a tough teacher in that she was particular about workmanship, from picking the glass to cleaning and polishing. She instilled in us the desire to be the very best and make each piece better than the last, even though at the time we were looking at stained glass as just a hobby. We have a great passion for wildlife, bird, western and flower panels, windows and lamps. From our attendance at various Christmas markets, farmers' markets and juried art shows in Alberta, we continued to be asked to make a great variety of stained glass items. As an example, to the right is an 18" x 27" great horned owl panel that we recently completed. The design is by Rob Torres of The Oak Tree Stained Glass in Wilmington, Delaware. A couple of years ago we were asked to bid on a church window, so we decided the time had come to purchase the Professional Edition of Glass Eye 2000 from Dragonfly Software. It was a simple learning curve even for users in their 60's, and although we didn't get that commission it gave us a huge boost of confidence in designing and making larger items. Not long ago we were approached by a client who wanted a prairie sunrise design. The design presented lots of new challenges for us This window was a double-paned sealed unit with decorative bars in between the glass panes. The bars could not be removed and had to be incorporated into the design. Having Glass Eye 2000 was great because designs could be sent by email and changes could be made quickly. The biggest challenge once the design had been agreed upon was ensuring that the ½" zinc frame would fit, and that took a few trips to the client's home. 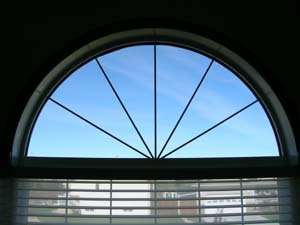 The window was not a perfect half-circle, being approximately 56" wide at the base with a radius of nearly 27". We used the Morton Layout Block System across the bottom and obtained plastic-covered lead forming pieces which worked very well in making the curve edging for construction. We had marked the frame at the last fitting for the exact location of the bars inside the window. 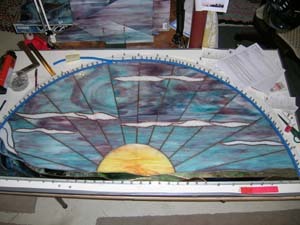 The pattern was adjusted slightly to ensure that the rays would match the window bars, together with a slight adjustment of the sun using a compass to get a perfect circle. To add strength, we inserted In-Bedded Strengthening Braid around the sun, between the earth and sky, as well as through all of the rays of the sun. We like to work with lots of color and our clients wanted a sweeping prairie design with mountains, foothills, prairie, lake and fields. We reversed the Uroboros glass over the lake to take advantage of its texture and changed the direction so it appears to be a grove of aspen trees. We also changed the direction of the foothills glass with its embedded glass streamers to create the look of trees approaching the mountains. The piece was all soldered (one has to take great care especially when doing the clouds) to ensure not getting to much heat at one time which could crack the glass. Once completed the window was cleaned and polished, and then installed next to the existing sealed unit using a vinyl insert to hold the window in place. 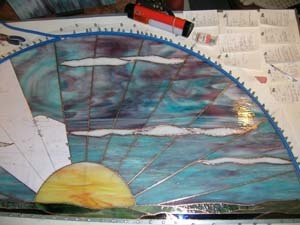 The Wissmach sky glass was perfect for the prairie sunrise skies we have here in Alberta. 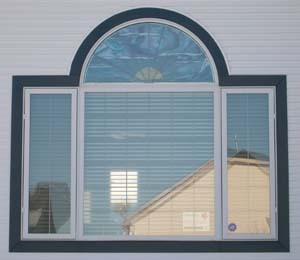 The window faces north/northeast and so will have less direct light in the winter months but will, during the summer, have direct sunlight in our much longer northern summer. Our clients were extremely pleased and delighted with their window. They can’t wait to see the full effect of the northern sun on their window next summer. 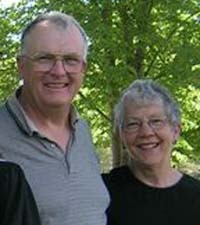 Bob and Flory Wilkins retired in 1999, choosing to travel in their fifth wheel for a couple of years. In 2001 they settled in Innisfail, Alberta and started attending farmers' markets with their excess items and demand grew from there. They do business under the name "Windows of the West Stained Glass." They are recognized by Spectrum Glass as one of the Professional Stained Glass Studios in Alberta and are also members of the Alberta Craft Council. You may contact Bob and Flory via email.